The Hibakusha (atomic bomb survivors) experienced an unprecedented, extreme example of inhumanity. passed away already, and those remaining do not have abundant time left. Japan is already seen internationally as a latent nuclear-armed nation. inhumane, unusable, and must immediately be abolished. Germany, which directly faced the history of the Nazi massacres, and walked from the past into the future. under the name of reconciliation. banning of nuclear weapons – otherwise his words are empty. that should have been sent from Hiroshima. stronger alliance between Japan and the United States. cycle, and pledge to work on these issues in connection. 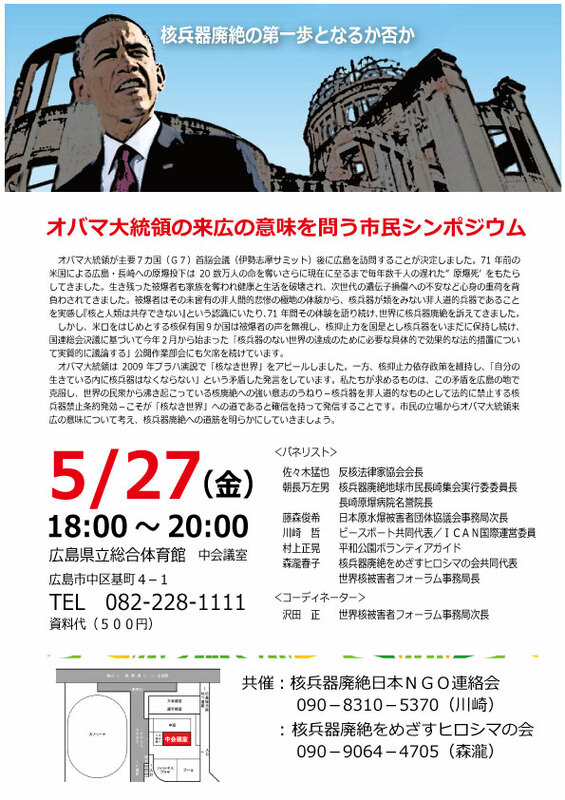 Anticipating your visit to Hiroshima at the time of the Iseshima G7 Summit Meeting, we beg your attention. 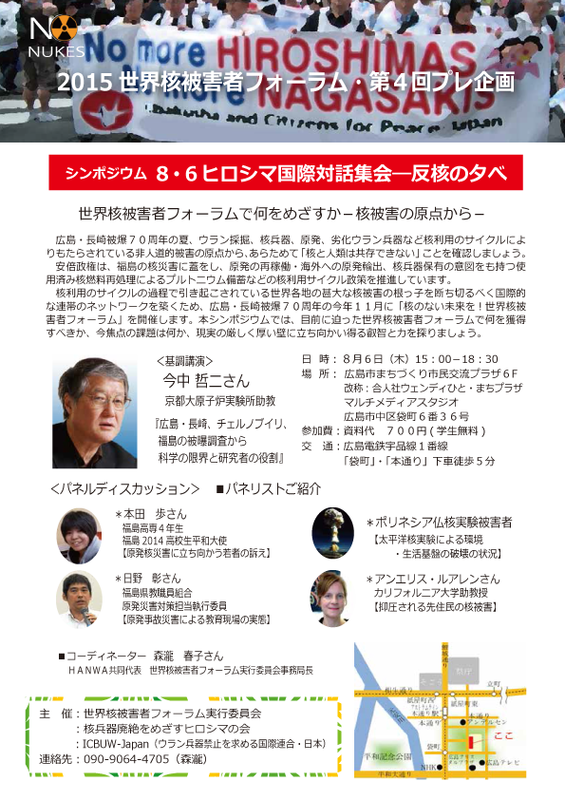 We are an umbrella organization of groups and individuals in Hiroshima working for the abolition of nuclear weapons, and we call your attention to the following. Seventy-one years ago, the United States dropped uranium and plutonium bombs on Hiroshima and Nagasaki. By the end of the year, those bombs had taken more than 200,000 lives. To this day, thousands of people are lost every year to a phenomenon we call “delayed A-bomb death.” Most who survived lost family members, their health, their means of making a living, and have carried a heavy burden of fear related to genetic effects in succeeding generations. The hibakusha experienced an unprecedented, extreme example of inhumanity. They know in their bones that nuclear weapons are uniquely inhumane weapons with which humanity cannot coexist indefinitely. For 71 years they have offered their testimony and appealed globally for the prompt and total abolition of nuclear weapons. Despite their efforts, the US, Russia and seven other countries continue to possess nuclear weapons with nuclear deterrence as national policy. Far from pursuing disarmament, the nuclear-armed nations conduct subcritical nuclear tests and otherwise seek to improve the function or performance of nuclear weapons. Meanwhile, nuclear-armed nations increase in number. Even the government of A-bombed Japan has recently adopted a Cabinet Resolution declaring that Article 9 of our Peace Constitution does not prohibit the possession and use of nuclear weapons. In fact, with its 47 tons of plutonium and well maintained nuclear fuel cycle, Japan is a latent nuclear-armed nation. In 2009 when you spoke in Prague, you called for a world without nuclear weapons. You went so far as to say, “…as a nuclear power, as the only nuclear power to have used a nuclear weapon, the United States has a moral responsibility to act.” But you also said, “As long as these weapons exist, the United States will maintain a safe, secure and effective arsenal to deter any adversary, and guarantee that defense to our allies.” This contradiction has manifested consistently in your administration throughout these seven years. By introducing a missile defense system in Europe, for example, you provoked Russia and brought a halt to disarmament negotiations. And you continue to modernize and improve your nuclear weapons. 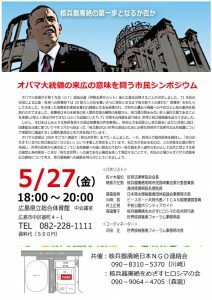 We beg you to use your visit to Hiroshima as an opportunity to resolve the contradiction between pursuing a nuclear-free world and relying on nuclear deterrence. When you visit the A-bomb museum and hear testimony from a survivor, you will personally encounter the indiscriminate slaughter of innocent human beings. You will see with your own eyes that no use of nuclear weapons can ever be justified. These weapons threaten the continued survival of our species. Please save us from this threat by declaring, from Hiroshima to the world, that nuclear weapons are inhumane, unusable, and must immediately be abolished. The United States actually did use nuclear weapons, inflicting previously inconceivable pain, suffering and death, including the endless horror of radiation exposure. As president of the nation that took us into the nuclear age, please tell the world that the dropping of the atomic bombs was a mistake. Please offer a sincere apology to the departed victims, and to those who managed to survive. We believe that such an apology is an indispensable step on the journey to a nuclear-free world. How can we realize a nuclear-free world without rejecting the root from which nuclear weapons emerged? The United Nations is currently hosting a working group on nuclear disarmament. That working group is discussing a nuclear weapons ban. The US, along with the other nuclear-weapon states, refuses to participate. This refusal is a mistake. It allows countries like Japan, which openly relies on the US nuclear umbrella, to oppose divisiveness, that is, nuclear-weapon versus non-nuclear-weapon states. Taking the side of the nuclear weapon states, they steadfastly oppose any discussion of a legal instrument prohibiting nuclear weapons. As citizens seeking nuclear weapons abolition, we are outraged. The US should attend the working group. As president of the world’s most powerful nuclear weapon state, you hold primary responsibility with respect to human survival. You should be standing in front, leading the abolition movement. A strong wave of desire for nuclear abolition is boiling up in many countries from the global grassroots. The tide of public opinion is shifting steadily toward a treaty that would prohibit nuclear weapons based on their obviously unacceptable humanitarian impact. Please use your moment in Hiroshima to tell the world that you have been convinced that a nuclear weapons convention is the one true path to a nuclear-weapon-free world. 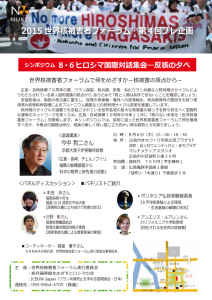 The people of Hiroshima seek an end to nuclear weapons and war. We obtain enormous encouragement from Article 9 of the Japanese Constitution, which renounces war, prohibits offensive war-fighting capability, and rejects the right of belligerence. Near the end of March this year, the Japanese government pressed through a national security act that allows our Self-Defense Force to fight alongside the US military. This act is a clear violation of Article 9, and we fear that your visit to Hiroshima will be used as a performance, evidence that Japan and the US have strengthened their alliance thanks to this national security act. Rather than strengthening militarism, we hope your visit here will strengthen the foundation of peace and goodwill on which the US-Japan partnership should be built. Auschwitz, Hiroshima, Nagasaki, Nanjing—these and many more are negative legacies of man’s inhumanity to man. Standing in these places with our hearts open, we see clearly the path humanity must take if we are to survive. President Obama, we hope you will have that experience in Hiroshima.